Berry Fields is not looking for a boyfriend. She's busy trailing cheaters and liars in her job as a private investigator, collecting evidence of the affair she's sure all men commit. And thanks to a pepper spray incident during an eighth grade game of spin the bottle, the guys at her school are not exactly lining up to date her, either. So when arrogant - and gorgeous - Tanner Halston rolls into town and calls her "nothing amazing," it's no loss for Berry. She'll forget him in no time. She's more concerned with the questions surfacing about her mother's death. As a huge fan of Pride and Prejudice and Veronica Mars, I was immediately interested in this book! Strawberry (Berry) Fields is a private investigator for her father, just like in Veronica Mars. She's perfected the art of the stakeout, and her dad's been entrusting her with some of his most important cases for years since (as she points out) nobody pays very much attention to kids. They'll never suspect her of spying! She's on a stakeout with her best friend, Mary Chris Moss, when Berry spies Mr. Moss (Mary Chris' dad) in a questionable situation. Her years as a PI have left her jaded, and she immediately suspects that he's cheating. Snapping a few quick pictures, she waits until later to investigate what she's seen. Going through the photos on her computer once she's home, Berry notices her mother's letterhead on a piece of paper Mr. Moss was holding. Which is strange... because Berry's mom is dead. Something strange is going on, and Berry's got to find out how her mother is connected to it all. As you can guess from the title, there are a number of parallels to Pride and Prejudice in this story. The blurb calls this "a playful nod to Jane Austen," and I think that's accurate. It's a fun and quirky take on Austen's famous novel. However, I often feel like adaptations rely so heavily on the source material that they no longer feel original or I spend all my time trying to identify how the two compare (such as, "Oh, this character must be the Wickham!"). So, unfortunately, I think the Pride and Prejudice aspect hampered the story in some ways because I'm such an avid lover of the classic novel. It immediately associated this story with Austen's in my mind, and I couldn't help but compare. Even though they were totally different! Unfortunately, I'd also just finished Ally Carter's Heist Society series. 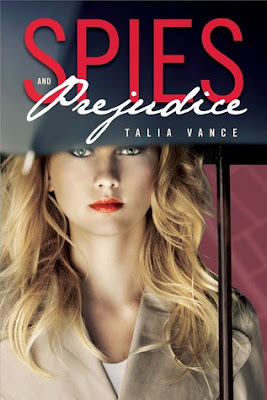 I say unfortunately because Carter and Vance's books are very similar in topic and tone, so I was also comparing Spies and Prejudice to those books. That being said, there were a number of things I really enjoyed about this book. Berry's friendship with Mary Chris seemed really realistic. You can see how much they love each other, and I love books with girls who are genuinely good friends and really look out for each other. Even when they argue, you can tell that they'll work it out in the end. The detective aspect was really fun, too. Although it didn't feel entirely believable that a teenager would be doing all these things, I still had fun reading about it. The plot is entertaining, and I thought it moved quickly. There's always something going on - so it's a fast-paced read with enough action to keep you hooked. However, I did feel like it was somewhat predictable. And I didn't find the mystery 100% believable - to the point that I thought, "Really?!" when all was revealed. Despite those quibbles, I thought this was a humorous and mysterious take on a well-known story. If you want a strong heroine with a dash of mystery, I'd recommend Spies and Prejudice. It's funny, cute and would be a great pick when you need something light! "There's a reason it's easier to talk to strangers than people you love. Strangers don't come with preformed expectations about who you are. Strangers don't hold you to a higher standard than you deserve. Strangers won't be hurt by anything you say." *I received a copy of this book from Egmont in exchange for an honest review. I was not compensated in any way for my review. BTW, fellow Veronica Mars fan, did you see the sneak peak/trailer yet? AND YES. OMG. SOOOOOOO GOOD! I need that movie to be out like right this second. Oh my goodness, I really wish I was a fan of the sleuthing books. I feel so left out of the genre/category! (And ssshhh I've never seen Veronica Mars.) But I've seen some reviews of this one that are basically similar to yours so I'm thinking this isn't one that I'd pick up because it seems lackluster to even fans of PI-type stuff. I DID recently try a sleuthing/boarding school YA book, Prep School Confidential by Kara Taylor, and I enjoyed that one. I'll actually read the next one when it's released early next year. But it isn't really based on anything large and overwhelming like Pride and Prejudice, so there are no huge shoes to fill. Hahaha to Veronica Mars! Gotta give it a try lady :) Do you like sleuthing TV shows more than sleuthing books or just not really a fan of it at all? If you're not, you might not like the show (obviously). But it is clever and smart TV! But yeah, I'd say pick up Heist Society before this one if you're interested in trying a sleuthing read!